From just £18.95 per child! There’s so much included in your party package, click below to find out more! All guests are welcome to stay after the party for a whole day of farm adventure. Ellie Elephant – blackcurrant flavour. Telephone the farm on 01525 852954 to check availability and to pay a £50 deposit. Minimum of 10 children, maximum of 22 children. Upon booking you will be asked to pay a £50 deposit. Please pay the final balance 10 days prior to the party and confirm your choice of menu. 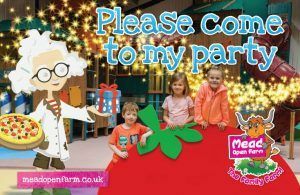 Please email a list of guests attending the party to guestservices@meadopenfarm.co.uk one week prior to the party. *After school party is 2 hours. * Instead of a party bag children under 3 will instead receive £1.50 discount off the cost of a party child. *Free child voucher only valid with a full paying adult. *Two adults free with birthday child only applies to birthday child, not joint parties. Seasonal activities such as The Magic of Christmas and Freaky FunFest are not included in the Party Packages and may be subject to an extra charge. Socks must be worn at all times in Shaggy’s PlayWorld. Children need to be over 0.9m tall to go down the large red and blue drop-slides, and must have their arms and legs covered. All children can use the wavy yellow slide. Tractor & Trailer rides April – September weather permitting. Plus full day of farm fun! Call the farm on 01525 852954 to book today!